This mural inspired the short story in EULOGIES II, now out from HW Press. It’s in the children’s play area at the Staunton Public Library. I’ve spent many hours looking at it while waiting for Mother Goose Story Time to start, so naturally I’ve spent many hours wondering what role it might take in a horror story. 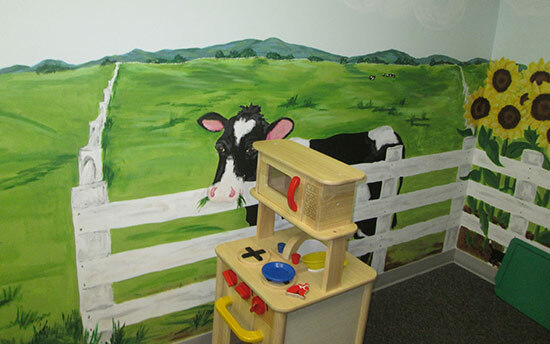 The mural in the children’s play area of Augusta City Library normally featured what you would expect. A cartoonish cow stood in a field bordered by a split-rail fence. But today, a shadowy figure with wings walked on the horizon. Do you see the shadowy figure with wings? Maybe if you keep staring. . . .